What Outsourcing to India can do for your Business? You have heard and read a lot about the good and bad of outsourcing to India. You want to give outsourcing to India a shot. But before taking the final plunge, you want to know what outsourcing to India can do for your business. Here is what outsourcing can do for your company. Outsourcing can be defined as a process, function, operation, job or task that can be executed by your own employees, but is instead outsourced or contracted to an external third party vendor for a specific time period. Offshoring is the strategic use of outside resources to execute business functions that were earlier handled by internal resources. Outsourcing can also be defined as a business strategy where a company outsources a part of their business functions to a specialized service provider, who becomes a valued business partner. In outsourcing, the third party vendor can execute your business functions either on–site or off-site. What jobs are Commonly Outsourced to India? What office functions can be outsourced to India? 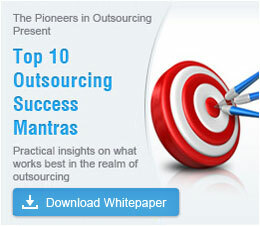 What are the advantages of outsourcing to India? How can I ensure that my outsourcing venture to India is a success? Now that you are convinced about outsourcing to India, why not make a decision to outsource to India today? Watch your company grow to new heights, concentrate on core business functions and get skilled resources to work on your projects–all by outsourcing to India. The growing phenomenon of nearshoring and what it entails.